As I was making my menu for the week, I realized just how crazy busy my week actually was. There is not even 1 night free, which isn’t unusual anymore. Instead of freaking out, I remembered that I prayed for all of this. The healthy kids, a wonderful husband, a job, a church we love, friends, etc. Each of those bring much happiness, and much busyness. There are athletic practices, music practices, church group, fundraiser dinners, church and even a Bieber concert thrown in there this week. Instead of feeling defeated before the week has really begun, I go back to my menu and start trying to figure it out. I need to make dinners that are delicious, healthy, plant-based & easy. Keyword here, EASY! I know I’m not the only one with busy nights, in fact, many of my friends and those I coach are constantly telling me how they eat out most nights and just can’t find the time to make a good “home-cooked” meal. But trust me, but with a little planning, you can make a good-for-you meal just as quickly as it’d take you to drive somewhere and grabbing something to go. And just in case you need a little extra help, here’s my downloadable Weekly Menu Planner to make dinners a little easier for you. As for a recipe, well I have that too! 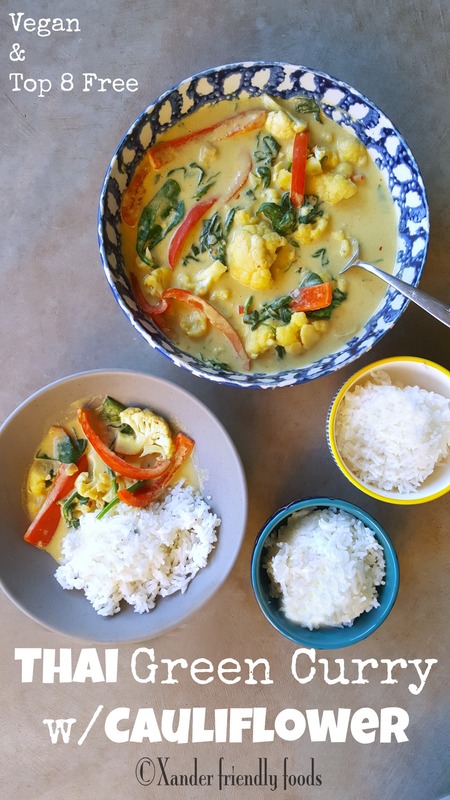 Whether you have had Thai food or not, this Thai Green Curry with Cauliflower will take you on a little culinary adventure and is a perfect start to your meal planning. This is a wonderfully, rich & creamy dish, with just enough heat to make you smile. Best of all, it’s so, so easy to make and takes less than 30 minutes! I’ve seen other recipes like this (at restaurants) that use shrimp, but I find that cauliflower is an amazing substitute for shrimp. Speaking of shrimp, back in the day, I use to love shrimp cocktail, but with my son’s food allergies and my choosing to go vegan, I tried using raw cauliflower instead of shrimp, and realized it tastes even better dipped in cocktail sauce then cold shrimp. You’ll have to try it one day! Anyways, back to this recipe. Remember when I said a little planning goes a long way? So does a little prepping. If you can make a batch of rice at the beginning of the week, or even just start a batch in your rice cooker when you get up in the morning, you’ll find that dinners come together a whole lot quicker. A nice big pot of Jasmine rice was already waiting for me, so all I needed to do was make the sauce (don’t forget to rinse, rinse, rinse, your rice to get all the starches off before you start cooking….you’ll know to stop rinsing when the water looks clear). Grab your pot (or wok) and melt your coconut oil. 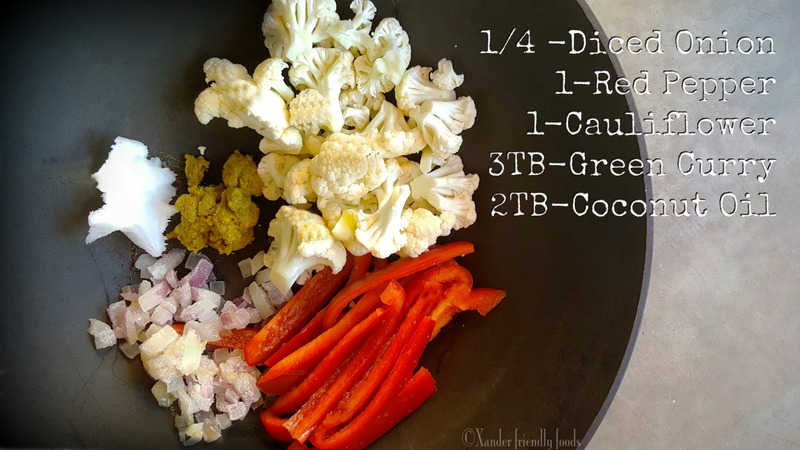 Blend in the green curry paste then toss in your red pepper strips, chopped onions and cauliflower. Cook this down for a few minutes until everything starts to soften. Now, we’re going to make this nice and creamy by adding in the creamy coconut milk! 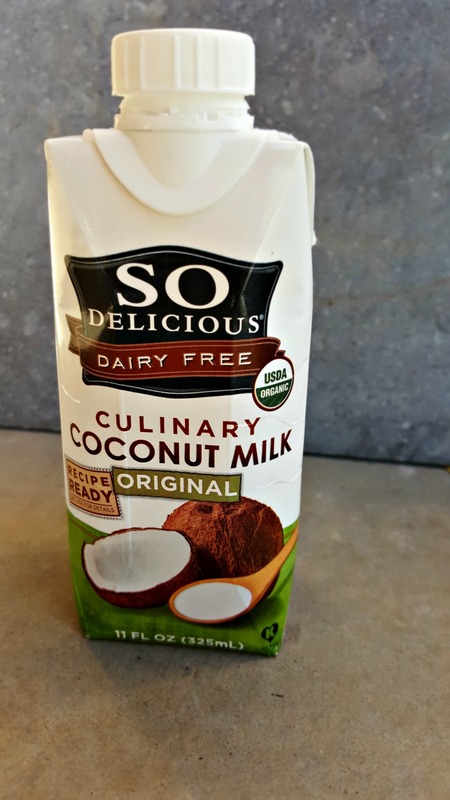 I used So Delicious Culinary Milk because it’s my favorite, but realized that I wanted to make it a little more saucy, so I ended up adding about another ¼ C of Unsweetened Coconut Milk and made my daughter extra happy. Keep stirring, because you don’t want this to burn, then toss in your baby spinach. Stir to incorporate it all in together and “ta-da”, you just made your own, home-cooked Thai dinner from scratch in about 10 minutes. Just plate your rice, top with sauce and veggies and if you really want to add another layer of flavor, squeeze some fresh lime juice on top…..YUM!!!! 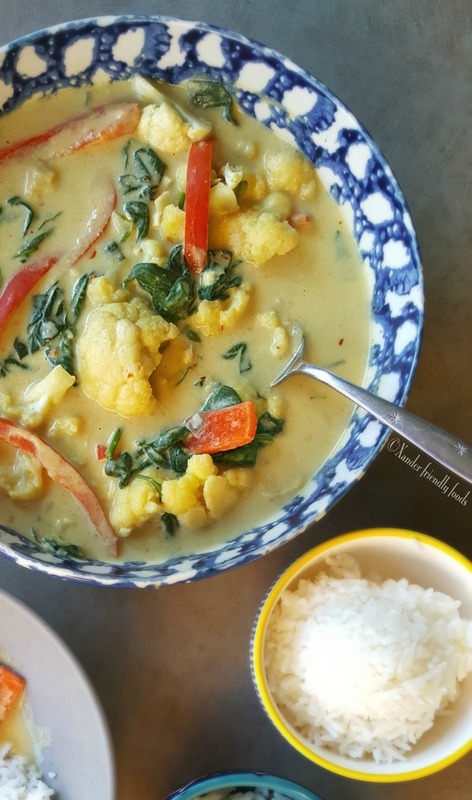 Delicious and easy, plant-based & allergy-free, Thai Green Curry with Cauliflower to impress your family & friends. In a pot (or wok), melt coconut oil. Stir in green curry paste then add in sliced bell peppers, onions,and cauliflower. Stir often, making sure there is no browning, 3-4 minutes. Add in coconut milk, spinach and crushed red pepper if using. Let cook 5 minutes, and allow flavors to meld together. 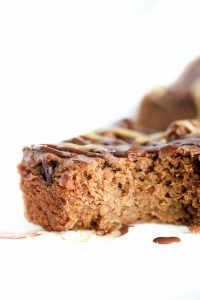 What are some of your favorite “allergy-safe” or vegan dishes? If you could duplicate ANY recipe but make it fit within your restrictions, what would it be? Ah green curry is my favorite! The flavor is just so perfect with all the veggies! I prefer green curry as well! And you are right, it does go so well with veggies. 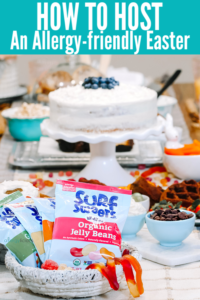 So easy and quick to make! Everyone needs recipes like this curry in their back pocket! I love the use of cauliflower in this recipe. I also use a lot of coconut milk – it’s one of my favorite vegan swaps! Mine too! I love just how creamy it makes everything. The flavours in this sound wonderful and I love how simple it is! I’m not much of a curry flavor fan but I always love how pretty the curry dishes I see look! This one looks beautiful. I love cauliflower though and how versatile it is! I didn’t like it the first time I tried it, but I’m blaming the chef, not the curry ;). I’d love to hear if you give it another try, especially if you make this dish. Who knows, maybe you’ll become a fan! Loved your recipe, I usually cook red Thai curry. Never tried green curry, my family likes Thai curries. Looks so delicious! Thank you Uma. I enjoy both types of curry’s but I’d love to hear what your family thinks of the green version. It’s always fun to change it up a bit. I’m making curry tonight! It’s my favorite easy recipe on a busy weeknight. Love the flavors in yours and your pictures are beautiful. 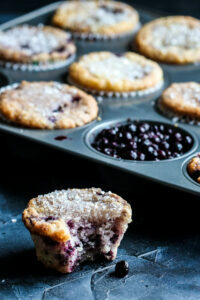 So simple and yet totally delicious! I love meals like this. Healthy, tasty and sooo quickly put together, love this curry recipe!! I love Thai curries! Did you make the green curry paste or buy it somewhere? If you bought it, could you please tell me which brand it is? I wish I could say that I made it myself! If you have a good recipe for that, please share. The one I used was by Thai Kitchen. I love their canned coconut milk and have enjoyed the flavor of their curry pastes as well. 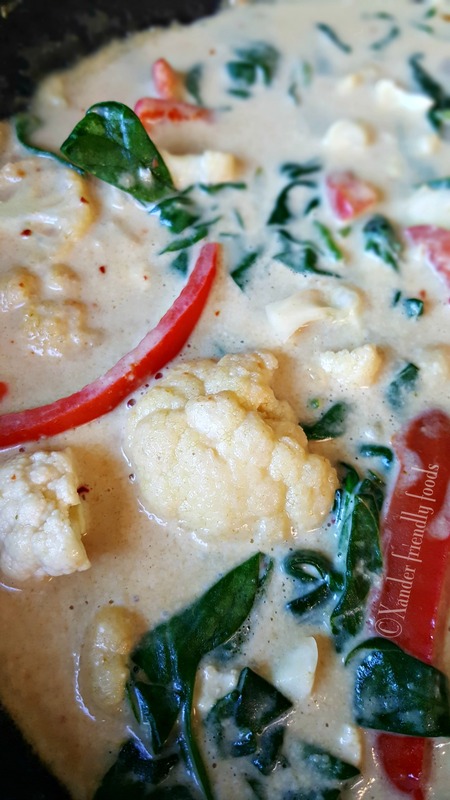 I love a good thai curry and this one looks delicious with the cauliflower. How could I incorporate potatoes into this? Oh I love that idea! You could just add some largely diced potatoes in there. I’d just add them to the pot early or precook in the microwave so they are slightly tender. This is what Google showed me when I searched for a Thai green curry to use up some cauliflower. Loved it. Cauliflower soaks up Thai curry flavours so well, and the baby spinach came out silky smooth. I love that this is a simple recipe I’ll soon be able to cook from memory and adapt for what’s on hand. Ended up deciding on red curry paste, forgot to buy onion, threw in some garlic and ginger instead, plus a small dose of red lentils. Awesome all the same, and perfect with jasmine rice. Listed as an entreé, but served as a main, and now contemplating going back for seconds. You’re so right, cauliflower does soak it up. So glad you enjoyed it and yes, I love having recipes that can adapt to what we have on hand or based off of our preferences. Can’t wait to see what you make next. I made this tonight. Added a couple mushrooms. Riced my cauliflower and made it in the soup when I added the spinach. Turned out great. Thank you! I bet those mushrooms tasted awesome in it! Thanks for sharing.